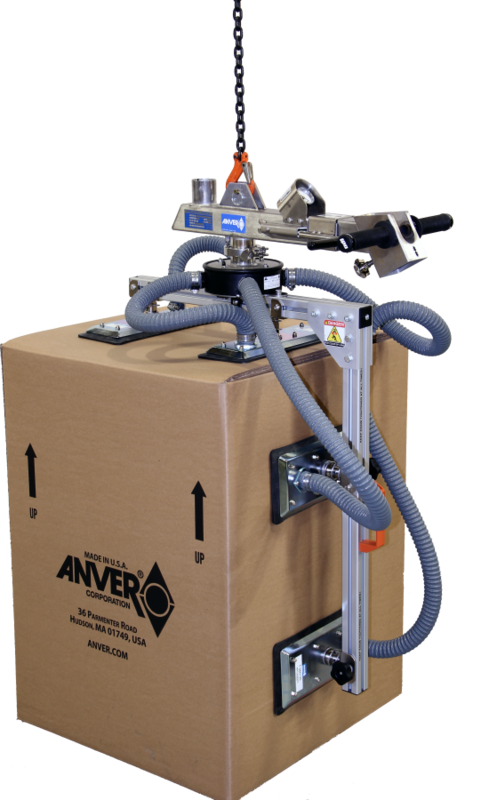 ANVER VB Vacuum Lifting systems are fully integrated systems designed for fast, safe, one person handling of bags, boxes and other porous-type loads. 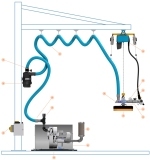 A large, ultra high vacuum, direct-drive pump provides the suction necessary for load holding; a rugged, electric chain hoist is used for load lifting. The chain hoist provides secure up/down movement. The load can be set in position to hang exactly where set, with no vertical drift. The VB system’s compact design requires little headroom. The standard lift length varies depending on which model is selected. Consult factory for headroom and lift length dimensions. Standard load capacities range from 275 to 1,100 lb (125 to 500 kg). Easy-to-use, ergonomically designed fully integrated controls are mounted on the handle to operate the vacuum release and hoist movement. A gauge to indicate vacuum level is mounted on the control to allow for monitoring by the operator. Extended handles with soft rubber grips are available. Handles can be extended for wide or high loads as required. Attachment of the load is continuous, for maximum productivity. The hoist is suitable for one or two lifts per minute. (For higher production rates, an ANVER VT Vacuum Tube Lift System should be selected).